"It is true that the AU initially condemned the coup, but it has said nothing ever since, not to mention SADC (the Southern African Development Community)," he told a seminar on Zimbabwe's future, organised by the South African Institute for International Affairs on Friday. He said SADC initially wanted to see a transition government in Zimbabwe, pending free and fair elections, but once Mugabe resigned, SADC called off its planned meeting in Harare "as if that was all they wanted to happen". He said it was important for the AU, the European Union, the United States and Britain to recognise that what happened was a coup and that the current government, headed by President Emmerson Mnangagwa, was an illegitimate one, or a "coup government". Mandaza also questioned the implications this would have for South Africa’s relations with Zimbabwe. President Jacob Zuma publicly shook hands with Mnangagwa when he was in Pretoria during the coup in Harare. 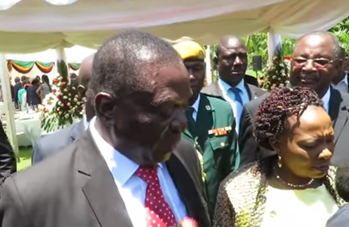 "In what capacity was Zuma shaking hands with Mnangagwa?," Mandaza asked. "I wonder what would happen if Mugabe were to leave for Singapore for his regular treatments. What if Mugabe, while out there, said he was forced to resign, which he was? What would be the implications? Can we explain why he is so closely guarded?" "Whether you like Mugabe or not, he was elected in 2013 and everybody accepted the election. You may not like the results, but he was elected," she said.